I want to talk about kindness. Christmas is almost upon us, a time of love, giving and festive cheer. And it feels right, to talk about kindness, to spread it, share it and celebrate it. Kindness has been all around me these few past weeks. When my mum had her accident 6 weeks ago, the kindness abounded – from nurses, to carers, doctors to friends – people just helped, supported, gave of themselves. To be at the receiving end was very special. Then only last week I joined my mother in the poorliness stakes and came down ill myself. I was gutted, on many fronts, not least that I was due to speak in Manchester at the Children’s Global Media Summit. I was excitedly talking not long after HRH Prince William, launching new children’s research we had been working on as a team for much of the year. As I lay in bed, full of antibiotics and paracetamol, I felt frustrated that this event I had so looked forward to was about to pass me by. However, 3 days later I decided I was going to make my speech, come hell or highwater. As I staggered weak and not well after my 4-hour journey into my Manchester hotel, I was greeted by a smiling Hannah on reception. Within minutes she had lifted my spirits, offered to bring anything to my room and reassured me they were all there if I needed anything at all. That Northern warmth enveloped me as I climbed into my cosy bed. Next day, I doubted I’d have a voice to make my speech (that was if I could even make it there!). Enter brilliant colleague (thank you Tim) who actually wrote the whole of my speech for me. And fabulous colleague number 2, Jacky, who canceled her plans, jumped on a train and arrived as contingency (in the end Jax and I did a double-hander presentation and much fun was had). Next day came the allergic reaction to the antibiotics. As I sat in the hotel restaurant passing out, a lovely, angelic face approached me, and with love said she was there to make sure I would be fine. With Mum and Tim at the other end of the phone line (I was really feeling rough) Edna, (as I now know is her name – although I call her my angel Edna) sat and talked to me, re-assured me, shared her life tales with me and just looked after me for the next hour. As we departed she gave me a hug and I knew we were meant to meet. Thank you Edna. 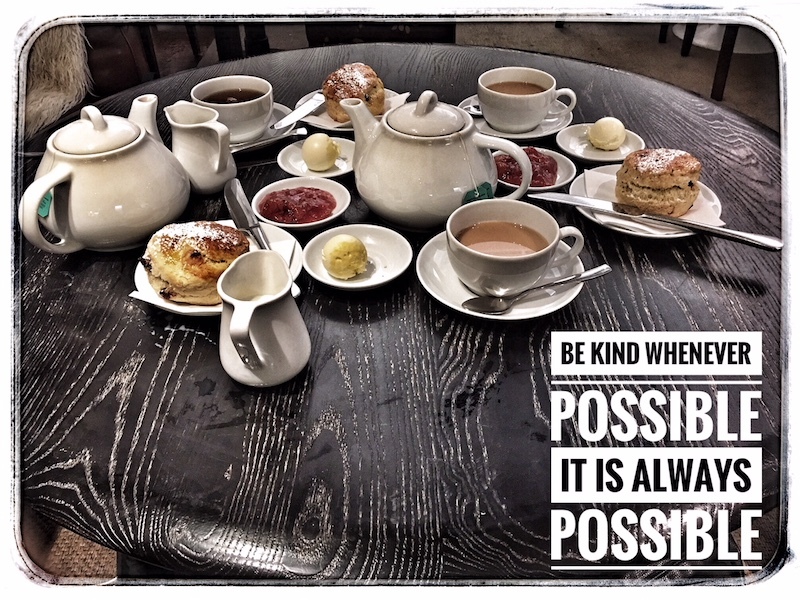 However, I am not just here to talk about receiving kindness… giving it is such a special thing too. In life, there are those who prefer giving to receiving – I happen to be a big fan of both! So I was very excited recently to find that one of my favourite researchers and happiness pioneers, Prof Sonja Lyubomirsky, has recently published some new research on kindness. Along with her fellow academics, her results show that performing acts of kindness directed towards other people, in comparison to acts treating yourself, has a greater positive impact on your happiness. When people were asked to perform acts of kindness for other people (group one) and acts of kindness for themselves (group two), those in the first group experienced a more significant increase in positive emotions as well as greater psychological flourishing – even two weeks after the experiment was finished. This might be partly explained by the range of emotions pro-social behaviour enables us to feel… when doing nice things for others, we can feel joy, contentment and love, which all promote overall wellbeing and improve our relationships. However, doing nice things for yourself does not provide opportunity to feel this range of emotions, nor does it benefit your relationships with others.